With its silvery leaves and dark purple blooms, Richard Gray Lavender was a lucky find at the Royal Botanic Garden in the 1980's. Like so many lavender, it is a naturally occurring hybrid. Woolly Lavender is one of its parents which explains the grayer than normal leaves. 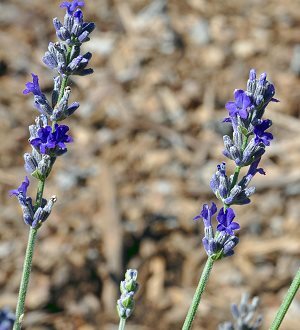 However, unlike Woolly Lavender, this lavender has a short sturdy growth habit, a longer bloom season and a spectacular dark purple flower. It is so gray, in fact, that in early spring we sometimes wonder if we have lost it, but then May hits and we are rewarded with this intense purple bloom. Because it is short, it makes a great front of the garden plant. We like it planted in front of our bright green Mulleins. Plant in full sun. After the second or third year, cut back by about a third after bloom. 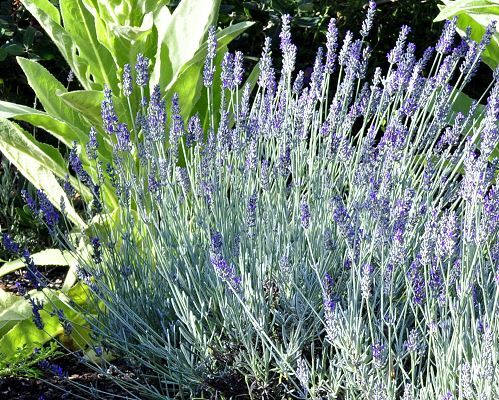 Richard Gray Lavender makes a great addition to our Zone 8-11 Fragrant Herb Garden Six Pack. This plant is often available in plug trays. These trays hold 128 of all the same plant. They are a great low cost way to fill a lot of space. Each cell is 3/4 of inch by an inch. Check here to see if Richard Gray Lavender Plug Trays are available.